Westminster has a Scottish problem and it is getting worse. After the independence referendum and the election of 56 SNP MPs, the Tories just haven’t a clue what to do about Scotland and how we should be treated and accommodated. The Tories sort of ‘got’ Scottish Labour. There was the old familiarity and they knew that they could be pretty easily contained. In the end, they probably found that more united them than divided them and when it came to the defining Scottish political issue of the constitution, Scottish Labour were the Tories’ willing partners. The SNP is something totally different. They simply observe us with something approaching slack-jawed bewilderment. It’s quite easy to understand why. The Tories are consumed with issues such as deficit reduction, immigration and EU membership. The little they know about the SNP can be confined to a sort of Daily Mail grievance about the Barnett formula and a commentary about the threat we pose to their union. We were the approaching ‘Jockalypse’ and characterised as a ‘threat’ with adverts showing us as pickpockets and thieves. For them, our Scottish concerns and contributions about austerity, nuclear weapons and more powers for our Parliament seem almost incomprehensible. SNP and Tory MPs also couldn’t be more disparate. Tory MPs are recruited from a totally different social background and our life experiences couldn’t be more different. So, how are they approaching this new and evolving relationship? Well, it seems to be to try and provoke Scotland as much as possible. Since the General Election, the Tories have opted to intentionally go out their way to antagonise and goad the Scots. Let’s look at some of the issues that have been predominately Scottish in character that have been put in front of the House recently. Firstly, their decision to cut support to Scottish renewables by abolishing the renewables obligation for onshore wind was done knowing the disproportionate impact on Scotland and the damage it would pose to our renewable sector. They simply couldn’t care less. Secondly, their almost arrogant approach to the Scotland Bill. English Tory MPs voted down every single amendment even though those amendments were supported by nearly all Scottish MPs. Probably most significantly, Scotland now has the indignity of having its Members of Parliament rendered second class and on the wrong side of an English veto on large swathes of certified legislation. All of these examples are given before we even get close to the Tory welfare legislation we didn’t vote for and fundamentally object to. An exercise of building bridges and constructively working on a troubled relationship it is not. It’s almost as if the Tories, after working so hard to keep us in their union, seem determined to almost kick us out the door. 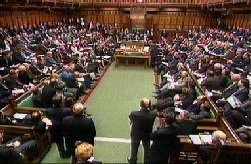 In the referendum we were asked not to leave the union, but to lead it; but the minute we get our Scottish backsides on those green benches our status as MPs is diminished and our interests have been outvoted and disregarded. The Tories and their unionist Labour sidekicks often say that the SNP goes looking for grievance to further our case of independence. It now seems that we are being shovelled the stuff in barrowloads. This entry was posted in Uncategorized on October 26, 2015 by petewishart. Pete Wishart (Perth and North Perthshire) (SNP): After an hour and 40 minutes, and six speeches, we are actually getting to hear from the Members of Parliament who this is being done to—the Scottish Members of Parliament. This will, I hope, be the last instalment of what can only be called the sorry saga of English votes for English laws. Never has such massive and significant constitutional change been undertaken on the basis of plans that are so meagre, so threadbare, so inept, and so stupid. I have searched the documents for all the statements that have been made about these plans and all the various words that have been used in these debates. I came up with a word cloud, because I hear they are quite popular just now, to see the favourite words used—namely, “shambles”, “disaster”, “mess”, “dog’s breakfast”, “unnecessary”, “won’t work”. There are some really good Scottish words that sum this up perfectly, with apologies to my friends in Hansard: “boorach”, “guddle”. Even those words do not do justice to the mess that has been created by these plans. In the course of the past couple of months since the Leader of the House’s plans were first introduced, he has managed to convince absolutely nobody about their quality. Not one political party in this House supports these plans other than the Conservatives. Not one devolved legislature, Assembly or Parliament throughout the United Kingdom supports these plans; in fact, they are resolutely opposed. Even the donors and the cronies down the corridor do not support these plans. Even the Procedure Committee, with a Conservative Chair and a Conservative majority, finds massive difficulties with what is proposed. An exercise in building consensus and working in partnership this most definitely is not. To proceed with such historic constitutional change without even a shred of consensus is probably about the worst way possible to embark on such plans. We will, of course, oppose the plans in full. We have not tabled any amendments because we do not want to dignify the proposals with any suggestion that they should be approved. We will vote them down altogether. We will support some of the Labour amendments, which are marginally better than what is on offer, but we will do so half-heartedly, because we object to the basic principle. The Leader of the House tries to convince us—he did it again in his speech today—that these are tiny, eensy-weensy little tinkerings with the constitution of the House. “What are all you Scots getting upset about?”, he wails at us. “What are you bothered about? It’s only a little veto you’re going to be exposed to.” Well, let me tell him: how dare you give us second-class status in this place. How dare you disrespect the views of the Scottish electorate and diminish the role of Scottish Members of Parliament. Mr Rees-Mogg: It is most important that the proposal does not create a second-class tier of Members of Parliament. Given that it comes under Standing Orders, in the event of there being a Government who are dependent on Scottish votes for their majority, they could repeal the Standing Order. Therefore the basis of the authority of each MP remains identical. Pete Wishart: I have a lot of respect for the hon. Gentleman’s views, but he is quite simply wrong. The basic principle of the plans is that I and my hon. Friends will be second-class citizens in the unitary Parliament of the United Kingdom of Great Britain and Northern Ireland. That is unacceptable. Scotland is watching this debate and the mood is darkening. If this is an exercise in saving the Union, the Government could not have contrived a more inept way to do so. Support for independence is increasing. The Conservatives got 14% of the vote in Scotland at the general election. It was an historic low. They have not secured such a vote since the 19th century. Once this has been done to Scottish Members of Parliament—our elected representatives—just watch their polls continue to plummet. Rebecca Pow (Taunton Deane) (Con): The proposal was a clear manifesto pledge by our party and we were voted in by the people. Does not the hon. Gentleman agree that it is the people who want this to happen? Pete Wishart: I do not think that English Conservative Members quite get it. The United Kingdom is supposed to be a partnership of equals. There are issues and difficulties—fair enough—and I know they are upset about what is going on with English votes for English laws, but we are a nation. Does the hon. Lady know how many Conservative Members there are in Scotland? One, and he barely scraped in. 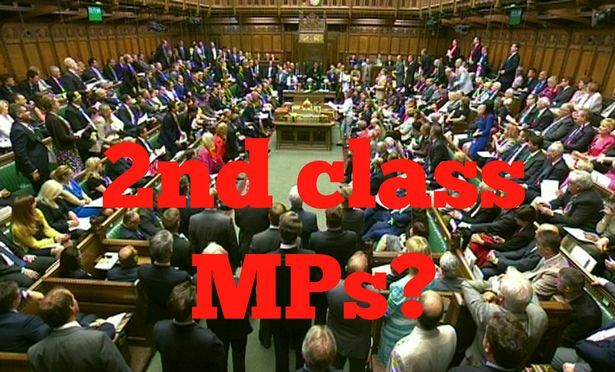 Our view is legitimate and we reject being made second-class citizens in this Parliament. This is our Parliament as much as the hon. Lady’s. This is the unitary Parliament of Great Britain and Northern Ireland, and yet we have to accept second-class status. No wonder the mood is darkening in Scotland. Mr Hanson: Andrew Bonar Law, Campbell-Bannerman, Asquith, Lloyd George, Gordon Brown, James Callaghan, Gladstone, Winston Churchill and a range of others had constituencies in Scotland or Wales and served as Prime Minister of the United Kingdom. Does the hon. Gentleman envisage a Scot or a Welsh MP ever again being Prime Minister? Pete Wishart: I say candidly that I do not envisage that happening again. It would be absurd for a Scottish Member of Parliament to be a Secretary of State for Health or Education, because they would be debarred from full voting entitlements on getting legislation through the House. I do not foresee there ever again being a Scottish, Welsh or possibly Northern Irish Minister in one of the great devolved Departments of state. I do not think there will be another Scottish Prime Minister. I am sorry to upset some of my hon. Friends, but I cannot think of any circumstance where that would be possible. This is the beginning of the process of creating two classes of Members of Parliament in this House and it will be instinctively followed by a hardening of those positions. Robert Jenrick (Newark) (Con): Will the hon. Gentleman give way? Pete Wishart: I want to make some progress, because I am conscious that a lot of my hon. Friends want to speak. This is the fourth time these hastily redrawn plans have been presented to the House, which says absolutely everything we need to know about them. [Interruption.] Does the hon. Member for Nottingham North (Mr Allen) want to intervene? He is chuntering away. Mr Graham Allen: I will gladly intervene, but very quickly, in view of what I said earlier. The hon. Gentleman is posing as a second-class Member of Parliament, but he is getting a first-class allocation of unlimited time. Perhaps he would care to give those of us who are second class a go as well. Pete Wishart: May I say ever so gently to the hon. Gentleman that this is being done to us and it has taken an hour and a half and six speeches before a Scottish Member of Parliament has been allowed to speak? We will take our time and I will not rush for his sake. I have scoured the fourth set of Standing Orders to see whether they change the first set significantly. Perhaps one curious thing could be explained to me. On the Speaker’s certification, the Speaker is now required and obliged to speak to two members of the Panel of Chairs before deciding whether a Bill will be English-only. I have a lot of respect for the Panel of Chairs—they do a fantastic job chairing the Committees of this House—but I have never known them to be an authority on the constitution. Surely it would be as well to ask two random members of the public for their views. The people that should be spoken to are the Scottish Government, the Welsh Assembly Government, the Scottish Parliament and the Welsh Assembly. They are the bodies that this is being dumped on and it is their devolution settlements that will be impacted, but there is no requirement on the Speaker to consult them. The most invidious thing about the proposals is what they will do to the Speaker. The Speaker will be politicised, which is almost unforgivable. That could set the Speaker in conflict with Scottish Members of Parliament. If we do not agree with and reject one of the certifications, what are we supposed to do? We are here to represent our constituents, so of course we are going to do what we can to ensure that their voice is heard. The proposal could lead to a challenge that goes all the way to judicial review and the Supreme Court. We know that the rulings of the Speaker are unchallengeable because of parliamentary privilege, but if constituents who watch what is going on here feel that their rights are not being represented properly, we will end up in the Supreme Court and judicial review. According to the right hon. Gentleman, Barnett consequentials are up there with Santa Claus, the Easter bunny and the tooth fairy. What he said about Barnett consequentials is absurd and I will give him the chance to take it back. Chris Grayling: I have asked the Scottish nationalists to offer one example of a piece of legislation outwith the estimates process that has had a direct financial impact on the budget for Scotland. So far, neither he, his colleagues nor my officials have been able to come up with one example. Pete Wishart: After the Leader of the House made those remarks, we went to the Scotland Office to look at the annual report and found that something like 56 Barnett consequentials were enacted in the course of one Parliament. Of course there are Barnett consequentials. It is absolutely absurd to suggest otherwise. I think the Leader of the House is trying to refer to downstream Barnett consequentials, but he is totally and utterly wrong about that as well. On the supply and estimates procedure, they are called estimates for a reason: they are an estimated departmental spend, and the Barnett consequentials from any subsequent legislation are simply consolidated in the next set of estimates. Mr Jenkin: The logic of the SNP’s position is to advocate an English Parliament, but what would happen to Barnett consequentials then? Pete Wishart: We would then have a federal system, which would allow us to collect and retain our taxes, and England would be able to do that, too. That is much more elegant. I am sure the hon. Gentleman agrees with the principle of taking responsibility for ourselves. We are happy to do that and I am pretty certain that my colleagues in England are more than equipped for the task of looking after their own country. There are some very talented people who could probably lead that devolved Parliament. It is up to them to secure and achieve it. We did the hard work: we built the consensus, had a referendum and instituted a Parliament. Why cannot they do that, too? What is wrong with making sure that they have their own Parliament? All these issues would then be solved. There would be no such thing as Barnett consequentials ever again. They can do their thing and we will do ours, and we could come together in a federal arrangement to discuss all the big, reserved issues. That proves that spending in the next set of estimates will be consolidated, proving that there are downstream Barnett consequentials. It is totally and utterly absurd to try to suggest that there is no such thing. Committee decides on two or three Departments whose spending will be rubber stamped. We will have to spend weeks, if not months, resolving that, and the Procedure Committee will have a big job when it comes to supply and estimates procedures. We object to this measure on three principles: it is making us second class; it politicises the office of the Speaker; and because of the new provisions and the legislative guddle that will be created. This is probably the one issue that will drive the demand for Scottish independence. I have heard some hon. Members say that it will save the Union, but this is not saving the Union—what we are doing in the House is creating division. If the Government want a solution, they must do the work and create an English Parliament—that is the way to proceed with such matters. This measure, and the mess, the bourach, the dog’s breakfast of these proposals, will only help me and my hon. Friends, damage the Government’s cause, and divide the House. The Government should take the proposals away, think again, and come back with something that it is sensible for the House to consider. This entry was posted in Uncategorized on October 23, 2015 by petewishart. Next week we will debate the second reading of the immigration bill. This will be something like the 6th immigration bill that we have considered in my 14 years in Parliament and it is pretty much the same as all the others. UK Immigration bills are rough variations of two main themes and these are to stop as many people as possible from coming here and to make life as miserable as possible for those that might have made it. This time round the debate will be in the context of the refugee crisis but it is difficult to see that this will in any way temper the traditional themes and debating points to secure the bill’s main objectives. We live in a globalised inter connected world where the movement of large populations has never been such a feature. International travel has never been easier and hundreds of thousands of people are continually on the move at any one time. It would be difficult to consider the world without this exchange of peoples and countries round the world have been enhanced with the arrival of new migrants. The UK is in fact an international globalised nation and we are a better nation because of that. Just look at London. One of the most successful international cities in the world, one third of the people who live and work in London were born beyond the UK. What has immigration done for us, eh? Immigration has enriched our communities and helped western democracies deal with some of their long term demographic challenges. And populations have always been on the move. Europe was designed by mass migrations and Scotland is just your common and garden but complex ‘mongrel’ nation. Continents have been entirely re-designed by migration and we are only a few generations away from the completion of both anglo-phone America and its latin southern cousin. Conquerors, colonialists and imperialists, of course, never had any concerns about their immigrations. Immigration is only a issue when it feels like it ‘is being done to us’. The contemporary political concern over ‘immigration’ quickly took off following the Caribbean immigrations of the 60s and it has raised in volume ever since. To accompany those concerns various attempts to control immigration have been deployed which the next immigration Bill is but one of a sequence. All have been almost total and abject failures and never had any real prospect of success. I remember betting the then immigration minister, Damien Green, a sum of his choice that even his ultra restrictive Government wouldn’t get immigration down to their tens of thousands. Under the Conservatives, and within ‘fortress UK’, immigration has gone up. But stopping people moving is only one part of immigration policy. Its other intention is much more subtle and is possibly more successful than its primary purpose. That is its use as a political tool and lightening rod. Immigration is the classic political instrument for political ‘othering’. It can be used as the default reason for all sorts of political problems from poor housing, unemployment and pressures in the health services – as UKIP’s electoral success has demonstrated. There’s nothing quite like having a convenient group to blame for all societies ills and demonised immigrants don’t come any more ‘convenient’. People are now more obviously and visibly on the move because of current global issues. The Syrian refugee crisis in particular has affected us in a way that no other recent migration has. The dramatic reporting of people fleeing from a bloody civil war has meant that we feel more engaged and determined to help especially when victims are being washed up on the beaches of Europe. Compare that with others currently on the move just now, the so called ‘economic migrants’. This group do not quite effect the same pathos and this division of good and bad migrants is a feature of the evolving immigration debate. ‘Economic migrants’ as a political term is a relatively new innovation but as a phenomena it is as old as the hills. Economic migration is the main driver of all great historic migrations but it has now emerged as the migration that will now no longer be tolerated. We live in a world where there is an almost grotesque unequal sharing of global resources. Do we seriously believe that people in one half of the world with no or limited access to those resources are going to stay put while observing how the other half live? As we look to the future we can only conclude that even more people will be on the move. At some point we are going to have to completely review our whole approach to immigration. If it’s more and more about keeping people out then considerably more resources will be required in what will have to be an increasingly militaristic endeavour. But how about addressing the unequal global division of wealth and look at the reasons why people decide to leave their country of birth? And let’s be creative. Enhancing border controls isn’t going to stop people from coming but having a fair system that rewards endeavour and matches ambition and skills just might. In the meantime there is this immigration bill and after that there will be another immigration bill and more and more people will continue to be on the move. This entry was posted in Uncategorized on October 5, 2015 by petewishart.